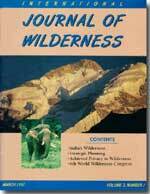 This issue of the IJW presents news about the 6th World Wilderness Congress, 18-25 October 1997 in India. John Hendee (managing editor) offers insight into this upcoming event – the first WWC to meet in a developing nation. A quiz by Kendall Clark and Susan Kozacek can tell you how your personal wilderness values rate, is fun and also proves extremely useful in wilderness management training sessions. 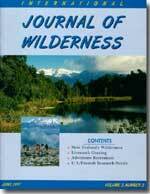 Aaron R. Kelson and Robert J. Lilieholm present a scientific study of how activities on adjacent lands influence wilderness resources. 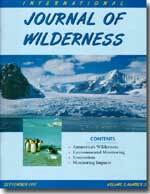 A very personal note from WILD’s President Vance Martin, remembering Sir Laurens van der Post closes this issue of the IJW. Vance retells when he first read “Heart of the Hunter,” and the mesmerizing way in which van der Post was able to capture in a story the “sense and texture of wilderness.” Vance continues on to tell of when he first met van der Post, at the 2nd World Wilderness Congress (Australia 1980), and lead to a 20 year working and learning relationship. 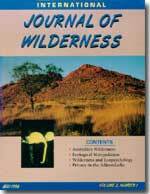 Mamphela Ramhele provides a study of how wilderness in used for healing in South Africa, with an emphasis on WILD’s partner organization The Wilderness Leadership School. He writes, “From time immemorial, the wilderness has been associated with the search for meaning and the need for restoration of interior balance…” This issue includes three great book reviews for “Guardians of the Parks, A History of the National Parks and Conservation Association,” by John C. Miles, “Wild Ideas” by David Rothenberg (ed), and “Troubled Waters: The Fights for the Boundary Waters Canoe Area Wilderness,” by Kevin Proescholdt. 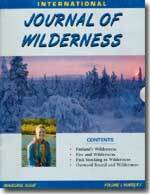 Roderick Nash, author of “Wilderness and the American Mind,” contributed an article for this IJW, on the implications of the internet on the soul of wilderness. 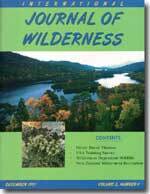 Stating an case much before it was mainstream, Nash encourages readers to step away from technology to experience wilderness. 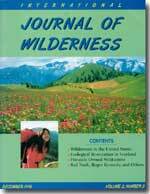 Greg Aplet and Jerry Greenberg provide a written history of The Wilderness Society (US), and an insight into new and changing goals for the organization. 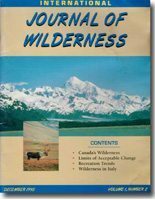 The inaugural issue of the IJW announces the 6th World Wilderness Congress (Bangalore, India 1997), and an editorial welcome by John C. Hendee, the managing editor of the Journal. 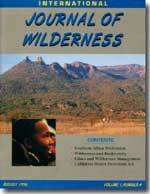 He states the vision of the journal as “an international voice integrating the wilderness and wild-land concerns of scientists, planner, managers, educators and citizen environmentalists, worldwide.” This issue also includes an article by Dr. Ian Player, founder of WILD, in which he tells the story of his friend and mentor Magqubu Ntombela’s words that prompted Ian to start the World Wilderness Congress and the organizations that now form The Wilderness Network.